Ever since Samsung announced its 85S9 Ultra High Definition TV, most TV manufacturers joined the trend and started to make 4K resolution TVs. Now, LG is preparing to release LM310UH1 SLA1, a TV/display with a diagonal of 31 inches and 4K resolution of 4096 x 2160 pixels! This UHD TV would use an active matrix of a-Si transistors with GB-r LED backlight type, brightness of 450 cd/m2 and a contrast ratio of 1000:1. We may be able to buy it in the upcoming winter holiday season. 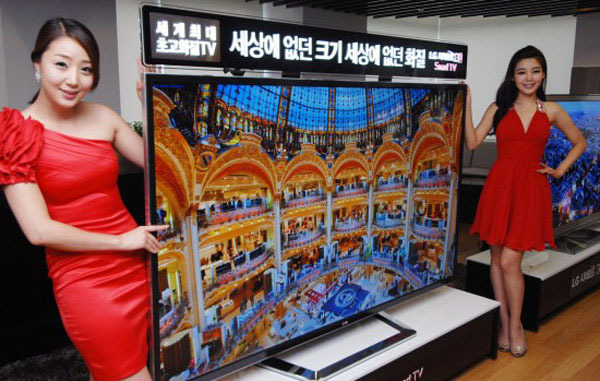 note: the TV in this post is not the 31 inch LG TV, but the 84-inch UHD from LG.